Global climate change is exacerbating water scarcity problems around the world, yet few businesses and investors are paying attention to this growing financial threat, according to a report by the Pacific Institute and Ceres. 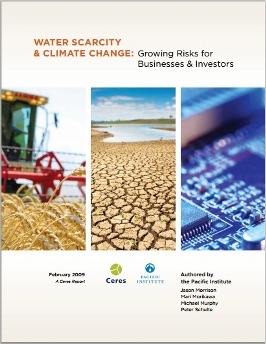 Water Scarcity and Climate Change: Growing Risks for Businesses and Investors identifies water-related risks specific to eight key industries, including electric power, high-tech, beverage, agriculture, apparel, biotechnology/pharmaceutical, forest products, and metals/mining firms. In addition, the authors also offer considerations companies can take to evaluate and effectively address water-related risks. Download a fact sheet from the report: Considerations for Assessing Companies’ Exposure to Water Risk.